Sorry about the late "mid" posting, but the month of October started off rather like the little rhyme: "Shake and shake the ketchup bottle, first none'll come, then a lot'll"! Passages is an exhibition that combines the projects of four artists exploring the concept of time and place using different techniques; knitting, quilting, embroidery, and ceramics. Margie Davidson (Edmonton, AB) recorded her year a stitch at a time in her project: Measuring a Year by the Minute. She knit sixty stitches per row, 24 rows per day and at the end of the year the project was an astounding 120 feet in length. Marcy Horswill's (Cumberland, BC) fibre work, Through the Other Side of the Fence, explores the adaptive relationship between wild roses and a metal fence, showing how the human-built conforms to the natural environment over time. The Isolation Project by Alana Wilson (Edson, AB) and Bridget Fairbank (Nelson, BC), records two lives spent in the isolation of the Canadian wilderness as fire tower observers. Bridget Fairbank's uses 126 small ceramic plates to represent each day that she spent alone in a fire tower during her seasonal job. By altering each dish, Bridget's personal take of daily isolation by way of routine is imposed upon each plate. Alana Wilson created small embroideries exploring ideas and pressures she feels as an isolated female in her early thirties. Deposit $55.00 – non refundable due on registration. Balance $200.00 due January 15th 2013. Bring your own lunch & snacks. Tea & coffee will be provided by Studio G Art. Fridge and microwave are available for student use. Need a quiet space during the day away from the hubbub of city life to work on your art? Tired of having to put everything away each night? Studio space available in the Okotoks area with a great view of the mountains and wide open space, allowing for inspiration for the great masterpiece. 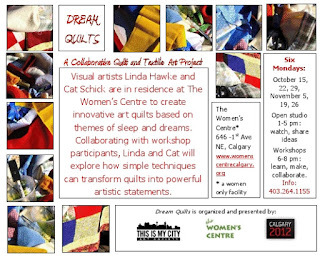 From Linda Hawke: My colleague Cat Schick and I are excited to begin the first stage of our Calgary 2012 artist residency, at the Women’s Centre of Calgary on Monday. The Women’s Centre is a women only facility however everyone will have a chance to participate in the next stage of the project when we will be quilting our creations in public spaces. Stay tuned for more information in early 2013. 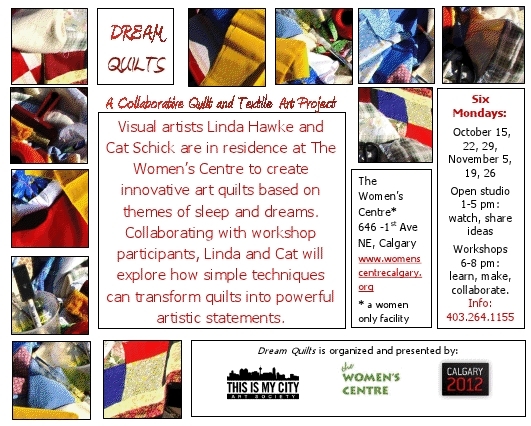 This project is organized and presented by This is My City Art Society, The Women’s Centre, and Calgary 2012. I am forwarding forward an invitation to participate in a Master's research project through the Human Ecology department at the University of Alberta. I will be making trips to Calgary to observe designers work with inspirational sources that are selected by me. Please let me know if you are interested. You may work alone or in groups if that is what you are used to. Calgary Designer Introduces New Lingerie Line: Local designer Tara Niscak (Neesh-chalk) introduces her new lingerie line to the public. Salonska Lingerie will be in stores this winter and is already available online at www.salonska.com The line promises to be a great addition to the already diverse collection of designers who call this city home. This is one of the very few lingerie lines that is designed and produced in Canada. Salonska Lingerie offers classic bias cut styles in silk, hand screen-printed with patterns from the designer’s drawings.All the pieces are made with impeccable details including bias cut styling, French-seams, bound edges and constructed with silk thread. “I was trained in surface design (screen-printing and dyeing) at the Nova Scotia College of Art and Design in Halifax. Since moving to Calgary I have been studying pattern drafting and fashion construction, so it made sense to have my two skills compliment each other with this line." Salonska's first collection is called the "Signature Collection". Eight pieces in the collection are designed to show off a woman’s curves. So if you love to show off your shoulders, the racer-back chemise with a pair of silk lounge pants would be perfect for you. If on the other hand, you have great legs but would rather cover up your arms – try the night shirt with a pair of French-shorts. 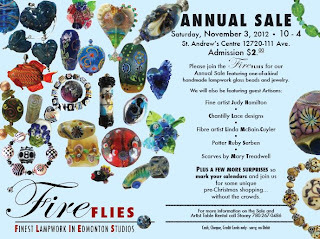 Join the Alberta Craft Council as we honour individuals and groups who make significant contributions to Alberta's fine craft culture on Saturday, November 3. 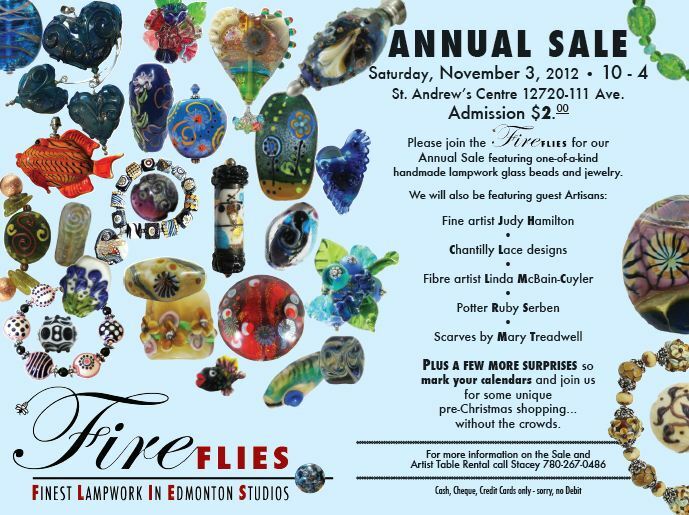 Recipients will also be featured in a Discovery Gallery exhibition, February 2013, in Edmonton. Click here for more information on all of the nominees. arlee barr has an article in the upcoming Art Quilting Studio magazine, Winter 2013 issue, available Dec1/12. An intriguing post from Pamela Allen, one of Canada's premiere textile artists--why do some of us feel we have to preface ourselves as "Quilt" artists or "Textile/Fibre" artists ? Remember we want to hear from you if you have news of exhibitions, workshops, miscellaneous interest items or questions. Are you being published somewhere? Were you interviewed? Found something especially special in the province that you'd like to share?